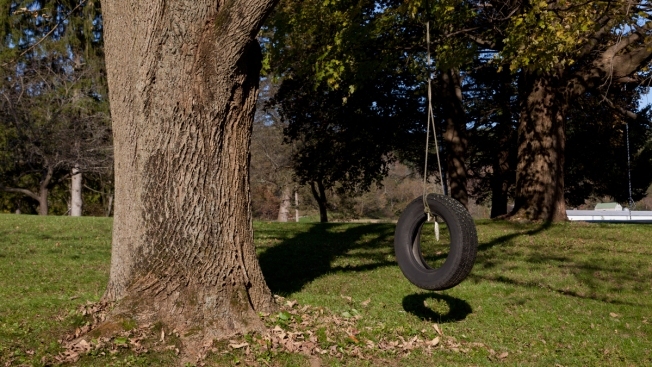 File photo showing tire swing. Teenagers in New Hampshire taunted an 8-year-old biracial boy with racial slurs and then pushed him off of a picnic table with a rope around his neck, injuring him, the boy's family said. The child was treated at a hospital for cuts to his neck following the near-hanging Aug. 28 in Claremont, the boy's grandmother, Lorrie Slattery, told the Valley News. He has since been released and has returned to school in Claremont. Slattery said the children were in a backyard when some of the teens got on the table and grabbed a rope that held a tire swing. It's not clear how the rope got around her grandson's neck, but Slattery said the teens pushed him off the table. No adults are believed to have witnessed the incident. An expert on abuse who spoke to the boy at the hospital said he swung from his neck three times before being able to remove the rope, Slattery said. None of the teens came to his aid, she said. "One boy said ... 'Let's do this,' and then pushed him off the picnic table and hung him," Slattery said. Claremont Police Chief Mark Chase told the newspaper his department is investigating an Aug. 28 incident involving several juveniles. He declined to provide details and refused to confirm the case involved the 8-year-old boy. New Hampshire Attorney General Gordon MacDonald said his office is reviewing all of the facts of the incident and if there is credible information that it constituted a hate crime or a civil rights violation, his office "is prepared to take any and all appropriate action."